The UN’s new post-2015 development agenda will take effect in 2016. Over the next 15 years, the international community will be guided by 17 Sustainable Development Goals (SDGs) in three categories: economic, social, and environmental well-being. The SDGs represent a comprehensive vision for global and national efforts on sustainable development. They include much greater attention to issues related to food and nutrition (zero hunger and good health), environment and climate change, employment, economic growth, inequality, and peace and security. In addition to expanding the agenda from the previous Millennium Development Goals which expire at the end of 2015, the SDGs apply to all people everywhere. For Canada, this will mean tackling the ongoing marginalization and inequalities faced by indigenous populations. The adoption of the SDGs, which coincides with the change in federal government, provides impetus for Canada to re-examine its priorities for national and international development, and to enhance its leadership and contribution on both domestic and global issues related to poverty – including indigenous issues and climate change. 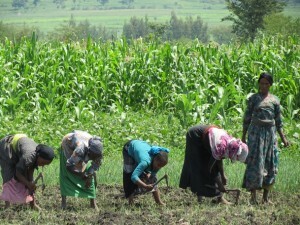 Over the last 10 years, Canada’s international assistance was guided by five thematic priorities (increasing food security, securing the future of children and youth, stimulating sustainable economic growth, advancing democracy, and ensuring security and stability), and three cross-cutting themes (gender equality, environmental sustainability, and governance). This has, in practice, meant private sector inclusion in the development effort. Canada’s commitment to address maternal mortality and child health (the MNCH initiative) has drawn considerable criticism from development practitioners who say that it has not gone far enough to improve the lives of women and girls. Despite the focus on these initiatives, the former government’s priorities had weak linkages with global development agendas, i.e., the MDGs/SDGs. These bode well for a re-alignment of Canada’s development priorities with the global development agenda. Poverty reduction will likely be the new government’s development focus in keeping with Canada’s Official Development Assistance Accountability Act. Food security and a secure future for children and youth will also likely remain key priorities for national and international development, with sustainable agricultural production, agri-business and nutrition a key focus under the food security theme. Climate change has already appeared as one of the priorities and, as expected, Canada has made a fresh commitment for climate change targets and actions to achieve them in the December 2015 COP21 talks. Donor communities and international financial institutions (IFIs) are reframing their aid/financing strategies following the post-2015 development agenda. Given the improved capacity of the national government, it is also anticipated that more development funding will become available in Canada. At the same time, it is expected that a portion of donor funding will be shifted to the country level to ensure its effectiveness, which will widen the opportunity for local level partnership for national and international NGOs. All in all, there is optimism within the development sector and a renewed commitment to pursuing these important strategies that will lead to clear and demonstrable advancements towards the goals of ending poverty, protecting the planet, and ensuring prosperity for all within the next 15 years.